This article looks at the strategies religious non-governmental organizations (RNGOs) with strong transnational linkages use to maintain a continued presence in mainland China. It does so by utilizing neo-institutional theory as an instrument for analysis, with an emphasis on outlining the coercive, mimetic, and normative pressures RNGOs face. One of the key findings of the study is that there is creative circumvention of isomorphic pressures by working with local agents, fostering trust with the local government, and keeping a low profile. Moreover, RNGOs dealt with the uncertain institutional environment in China through staff exchanges, denominational supervision, tapping into global platforms, and undergoing a professionalization process. 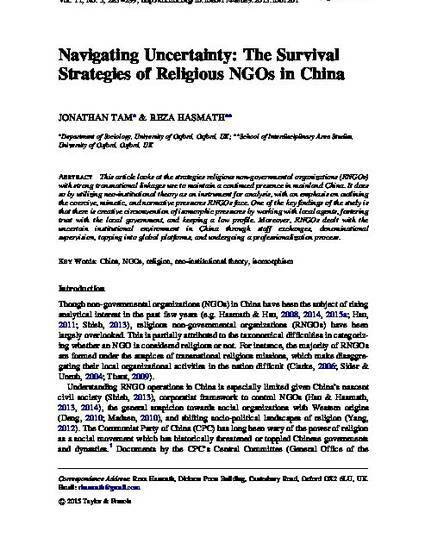 Tam, J. and Hasmath, R. (2015) “Navigating Uncertainty: The Survival Strategies of Religious NGOs in China", Journal of Civil Society 11(3): 283-299.